We’d love your help. Let us know what’s wrong with this preview of Solace and Grief by Foz Meadows. To ask other readers questions about Solace and Grief, please sign up. From the opening paragraph, which takes place on a four-poster bed with "tattered hangings of white gauze", thoughts akin to the video clip for "Total Eclipse of the Heart" came to mind and I knew that this was going to be a bit of a hackneyed read. To my credit I read more than half the book before I gave up. Because it was so boring. The book is about Solace who is a vampire, but I didn't read anything to build upon or contribute meaningfully to the vampire myth the I couldn't finish this book. To my credit I read more than half the book before I gave up. Because it was so boring. The book is about Solace who is a vampire, but I didn't read anything to build upon or contribute meaningfully to the vampire myth the entire time. Solace runs away and befriends a group of outsiders, who all seem generic and one-dimensional. They are all introduced like this: this is the person. This is what they look like. This is what they are wearing. It appears more like a tired roll-call to cast actors rather than intriguing revelations of characters. It doesn't help that there are so many of them as well, all being introduced at the same time and all trying to claim main status. I have read that this book improves after a long start, but sorry, I couldn't stick around till then. I'm under the belief that stories should kick in at the very beginning. To me this doesn't seem like a novel to me. It feels more like a fanfic written by someone who is crushing on a group of characters they've created and just want to write all about them and every little thing they do. I admire her commitment and passion for her characters, but sometimes it isn't enough to make a great book. I'm sure though, that if you like this genre, you'll probably like this book... but I wrote this review for ordinary readers, from an ordinary reader who just picked it up because the blurb sounded interesting. Solace & Grief got off to a slow start - the first third of the novel, while beautifully written, was somewhat stagnant. Solace runs away after a meeting with a faceless man, makes friends with a bunch of unemployed youths who live in a warehouse. She has some vaguely vampire-like traits - the sun tires her, she's strong, she can eat very few foods. It's all very mysterious, but not a whole lot seems to happen. But then - we get to the second third of the novel and bam! there's Wow. Just, wow. But then - we get to the second third of the novel and bam! there's suddenly tonnes of crazy stuff going on. Reality bending, alternate universes, people with special Tricks who are known as the Rare and someone out to kill them. Or capture them. Or something. There was a lot going on. I loved the ideas behind everything, this whole Rare species, the unique abilities everyone had. I think at times the dialogue was a bit unbelievable - young Australians in this day and age don't tend to talk so eloquently - but there were so many lines I absolutely loved and had to write down. The final third of the book was amazing - while everything was not totally wrapped up, we did get some answers, and it was a very exciting ending. The kind you think about long after you've finished the book. This is a vampire novel, and I think it'll appeal to paranormal romance fans, but also to people who don't like the whole vampire trend. It's just different enough to make it refreshing but also appeal to the people who already love books like these. I hope it gets picked up by an American publisher soon - I can see it having a lot of crossover appeal (it reminded me somewhat of Cassandra Clare's Mortal Instruments series, though I'm not entirely sure why). Solace and Grief is beautifully written novel and blends the concepts of vampires and other paranormals or Rare with social issues such as homelessness, alcoholism and general displacement and listlessness. Solace grows up in a group home where for seventeen years she feels as if she doesn't fit into the world. After dozens of foster parents fail to materialise on the day they are meant to pick her up, Solace is resigned to living out the remainder of her teenage years with the eclectic mix of o Solace and Grief is beautifully written novel and blends the concepts of vampires and other paranormals or Rare with social issues such as homelessness, alcoholism and general displacement and listlessness. Solace grows up in a group home where for seventeen years she feels as if she doesn't fit into the world. After dozens of foster parents fail to materialise on the day they are meant to pick her up, Solace is resigned to living out the remainder of her teenage years with the eclectic mix of other unwanted group home kids. That is, until the day the Faceless man begins to stalk her and for reasons unknown to Solace, she is compelled to run away. Solace encounters a ragtag group of youths in a club and almost immediately forms a bond with them. It isn't till much later that Solace learns that every member of her new found group of friends is a Rare and all have their own special Tricks. Sound great at this point doesn't it? That's what I thought too at the beginning, and then the "getting to know you" bit went on and on and on. 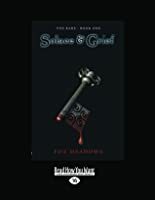 Much of the book is spent idly hanging around the Gadfly club where Solace initially meets her friends, or sleeping in the warehouse they all live in. While I was compelled to continue reading because of the premise and the writing, I have to admit that at times the story dragged and I almost thought it was a bit pointless. Things do pick up towards the end of the book though and I think the small twist was what saved it for me. Character wise, there was a lot of scope for some great personalities in this book, what with the special powers and the sheer number of friends Solace makes. I really liked the idea of a group of ragtag teens coming together to fight evil. Unfortunately, this was one of the areas where I believe the author let herself down. Besides Solace's closest friend Manx (whose power is to turn into a giant house cat..LAME! ), I can't remember anything distinguishing about any other characters. Even whilst I was reading the book, I kept thinking how interchangeable everyone was and there were times when I had no idea who a couple of the girls were. Solace herself was far from being a kickass heroine. Most of the action in the book was thrust upon Solace and she just reacted. Rather slowly I might add. For a vampire with super strength, I was disappointed with her if I were to be honest. Even the tiny bit of romance in the book felt incredibly out of place because of the previous disinterest shown by Solace and then when things started happening, Solace exhibited some overwhelming emotions that seemed to come out of nowhere. I know it was meant to be a paranormal fantasy but I just couldn't suspend my belief for this book. If only because Solace's group of friends were meant to be street kids and vagrants and yet their dialogue was more befitting a high tea luncheon. I was also a tiny bit concerned with the very liberal portrayal of underage drinking, drug taking and general aimlessness. I'm not sure at this point if I'll check out book two. The writing as I've stated was incredible. That and the concept of the Rare has carried this book past the neutral rating mark. I'm not sure if I'm invested enough in the story to overlook the lackluster cast though. Solace Morgan grew up in a group home in Australia, that was more often than not filled with damaged and problematic kids. She was home schooled and spent much of her time by herself growing up, not having any real friends. During all this time she always knew she was different from the other kids because of her mysterious food allergies, low tolerance for the sun and special abilities. Solace suspects that she's a vampire. The day before her birthday, Solace feels the urge to leave the group home after several mysterious messages saying "You don't belong here" and a harrowing experience with a man who instills fear in her without even seeing his face. So for the first time ever, Solace leaves the only home she has ever known on her seventeenth birthday. Solace soon runs into a group of misfit teenagers at a club in downtown Sydney, and she ends up staying with them at an abandoned warehouse. Solace soon begins to realize that her new friends may just be as different as she is, thus begins her journey into new friendships, self discovery, and the excited world of the Rare. Solace & Grief starts out at a good pace with a strong touch of mystery in the prologue. But I found the pace slows down after the prologue until about the middle of the book, then the pace explodes and the questions start getting answers plus the actions of certain characters are demystified, especially Solace’s actions. I didn’t feel a connection with Solace at the beginning because there were a few times where her choices didn’t ring true and she didn’t strike me as a carefree personality who’d make those type of choices. One of those times is when she meets her new friends and takes up with them immediately, I felt she was entirely too trusting with them. But by the end of the novel I did find myself liking Solace a lot more. I liked the eclectic cast of supernatural characters, who all had their own quirks and gave the story a sense of Alice in Wonderland feel, which I found to be entertaining. Even though the beginning was slow, I just loved the the ending. I’m just itching to tell my favorite part but I can’t because it’s a major part of the ending. The end left me feeling absolutely thrilled about where this series is heading. I think I would've enjoyed this more if I was younger, for it is very much a young adult novel. For an adult the actions of the characters don't always make sense, and the character development in terms of some characters is weak. It is hard to feel anything for any of the characters. Now that is the bad part - the good part is the world building in terms of powers is well done - even if Solace seems to have too many. It is awesome beyond worlds that the chosen one is a girl. The interactions bet I think I would've enjoyed this more if I was younger, for it is very much a young adult novel. For an adult the actions of the characters don't always make sense, and the character development in terms of some characters is weak. It is hard to feel anything for any of the characters. Now that is the bad part - the good part is the world building in terms of powers is well done - even if Solace seems to have too many. It is awesome beyond worlds that the chosen one is a girl. The interactions between the friends read and sounded like interactions between friends. Twilight meets Supernatural meets Heroes meets... This one really does have it all. Inspired by Buffy the Vampire Killer reruns, Meadows came up with a prologue that will knock readers’ socks off. It’s possibly the most intriguing prologue I’ve ever read. Thankfully I was blessed with a rainy day and had nothing better to do than read. Even so, I’m not sure I could have put this book down. Solace Morgan is a vampire. She has suspected this for some time; growing up, she knew she was different giv Twilight meets Supernatural meets Heroes meets... This one really does have it all. Inspired by Buffy the Vampire Killer reruns, Meadows came up with a prologue that will knock readers’ socks off. It’s possibly the most intriguing prologue I’ve ever read. Thankfully I was blessed with a rainy day and had nothing better to do than read. Even so, I’m not sure I could have put this book down. Solace Morgan is a vampire. She has suspected this for some time; growing up, she knew she was different given the array of food she’s allergic to and her body’s odd reaction to sunlight. She knows nothing of her parents, or lineage having been raised in a group home for kids no one wants. But on her seventeenth birthday all that will change. Compelled by a voice in her dreams, Solace leaves the only home she’s known to trek through the suburbs of Sydney headed for the city’s heart. Once there she is drawn to an underground club where she meets a group of young people, others like herself who don’t quite fit into society. As Solace learns they are all members of a select group called the Rare, individuals with extraordinary talents: those who see the future, read minds, summon fire and manipulate the very fabric of reality. With these newfound friends—the first she’s ever had—Solace embarks on a dangerous path to discover her origins. But as she soon learns, there are others who have been watching and waiting for her, others who have absolutely no regard for her well-being. Solace & Grief isn’t just a vampire story. Like so many of Ford Street’s titles, this is a story about difference, about how a group of young people bond through and come to terms with their differences. It is also a story about our own true nature: can Solace reject the thousands of years of vampirism encoded in her genes and choose not to feed on human blood? Or is she, and we, little more than pre-programmed flesh and blood machines set to follow a pre-determined path no matter how destructive? Meadows’ language is descriptive and evocative and her imagination seemingly limitless. Through her well-crafted narrative she creates a sense of menace and mystery that is threaded through even the more light-hearted scenes. Her characterisation, too, is excellent. Foz Meadows is a name to watch. Solace & Grief by Foz Meadows is quite unique in YA novels. 1 it's Australian. 2 it is aimed at the older teen market. 3 it is quite well written and 4 it avoids most of the teen angst. Solace runs away from foster care and finds a group of people with unique abilities just like she has. But who is after her and where does she come from? More fantasy then supernatural and a good read. This was an interesting book and a great experiance. 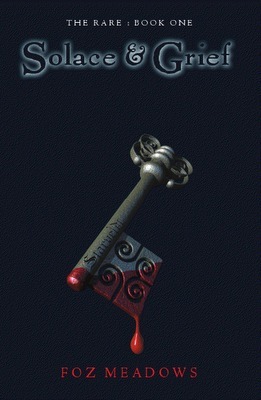 A YA vampire book concentrated not on romance, but on the search for identity. I enjoyed it probably more than the amount of stars indicates. Serviceable, and some nice concepts, but I have absolutely no urge to read more. This book is a good debut novel and I’d recommend it solely on the fact that it’s set in Sydney—except that there’s enough meat in the story to make it interesting beyond the setting. The beginning of the novel is a little drawn out and seems to go nowhere for a while. I mean, interesting stuff happens to Solace, but I just didn’t feel like I cared too much until it turns out that Solace’s friends have their own peculiarities. Solace and her friends’ gifts are revealed slowly but deliciously, an This book is a good debut novel and I’d recommend it solely on the fact that it’s set in Sydney—except that there’s enough meat in the story to make it interesting beyond the setting. The beginning of the novel is a little drawn out and seems to go nowhere for a while. I mean, interesting stuff happens to Solace, but I just didn’t feel like I cared too much until it turns out that Solace’s friends have their own peculiarities. Solace and her friends’ gifts are revealed slowly but deliciously, and the end of the book is a real page-turner. Meadows explains the mythology of Solace’s world and introduces elements of her past through various means. If you like mythologies and mysterious pasts, though, there’s plenty of it in this book. The second half of Solace & Grief introduces riddles and hints at a prophecy that hints at a secret romance. I’m a sucker for riddles and prophecies and romance. I love, love, love them! And this is where the book turns around for me, from being so-so to a must-read-the-sequel-now. Meadows also hints at undiscovered powers, not just for Solace, but for the others. I’m a sucker for mysterious powers. Wait. Actually, I think it was the cranky cat with a swan fetish that really sold the book for me. A very different reading experience from what I was expecting. It was more "edgy" and dark, for one thing, and gave me a glimpse into what I can only imagine life on the streets for a young person is like. One thing that struck me is that a lot of the events in the novel happen to the characters rather than them causing things to happen, so it often seemed as if I was on a bit of a roller-coaster with things appearing in my line of sight that I had not seen coming and couldn't predict. That the ch A very different reading experience from what I was expecting. One thing that struck me is that a lot of the events in the novel happen to the characters rather than them causing things to happen, so it often seemed as if I was on a bit of a roller-coaster with things appearing in my line of sight that I had not seen coming and couldn't predict. That the characters had little clue how to deal with these events was also unsettling. And yet at other times, and I'm thinking in particular of how she discovered her parents and her mother's diary, Solace behaved in a way that went far beyond what I would have expected of her. That there was no precedent for it was also unsettling. I'm finding this book quite hard going at the moment. It is interesting but I can't seem to care about Solace. I think I'll enjoy her friends more. ... now that I've finished I still think I like Solace the least. But that is ok, I rarely ever like a main character but prefer the supporting characters because they are usually more likeable and less whiny. Probably because you don't have to read all of thei I'm finding this book quite hard going at the moment. It is interesting but I can't seem to care about Solace. I think I'll enjoy her friends more. ... now that I've finished I still think I like Solace the least. But that is ok, I rarely ever like a main character but prefer the supporting characters because they are usually more likeable and less whiny. Probably because you don't have to read all of their thoughts. I wish that the other characters had been explored more, especially Harper and Laine. What are their backgrounds? I hope this is revealed in the other books in the series. Lots to like about this, plot that had a decent amount of complexity, and the world building is fabulous. Unfortunately, it reads like it really needed another edit - sections were sufficiently confusing that I had to read them through more than once to try and work out what was going on. I'm not convinced about the characters, but then I wasn't particularly keen on teenagers when I was one, a story full of slightly odd individuals didn't improve my perceptions of them. But to put this in context Lots to like about this, plot that had a decent amount of complexity, and the world building is fabulous. Unfortunately, it reads like it really needed another edit - sections were sufficiently confusing that I had to read them through more than once to try and work out what was going on. I'm not convinced about the characters, but then I wasn't particularly keen on teenagers when I was one, a story full of slightly odd individuals didn't improve my perceptions of them. I picked up this book because I wanted to read the author, not the content, and I kind of enjoyed it. I definitely like the way she writes but I lost track of the characters too easily, there were too many of them for me to keep track. The characters that did stick out to me were never mentioned again, but the characters who WERE important, were so numerous and ever-present that they, and their abilities all blurred together. Which is why only 3 stars. Reading small Australian publishers. Australian authors, characters and locations. Great descriptions of Sydney and the fictional underworld/otherworld. A little slow at parts but builds tension. Recommended. ABSOLUTELY FABULOUS 2011 Cybils nominee. Foz Meadows is a genderqueer fantasy author with a pronounced weakness for Dragon Age, fanfic, webcomics and mornings that are so late as to technically constitute noons. She currently lives in Brisbane.